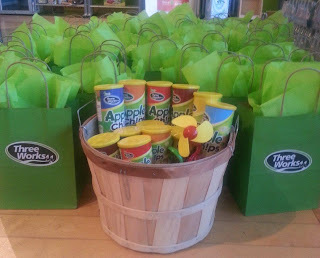 ThreeWorks Apple Chips have arrived and can be found in a grocery store near you. They are fat free, gluten free, GMO free and contain no added sugar. 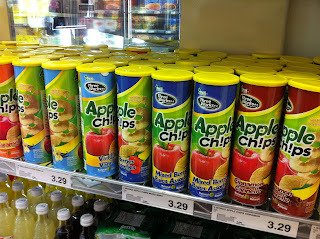 Apple Chips are available in six crunchy flavours - Original, Caramel, Vanilla, Lemon, Mixed Berries, and Cinnamon. They are also available in two sizes, the smallest size containing a mere 100 calories. ThreeWorks Apple Chips are made from carefully selected Fuiji apples and dehydrated in a way that retains the fruit's natural flavour, making it a tasty snack. These Apple Chips do not contain any colours or artificial flavours which means I can add them to my kids' lunch bags and feel good knowing that this snack contains natural ingredients. While I like the practicality of having a small size on hand during those occasions when we have to quickly run out the door, I would much rather buy the larger sizes to reduce the amount of packaging. Each can has a seal beneath the top and then additional packaging inside the can. I assume it's to help maintain product freshness but I'm hoping they can find a way around that to help reduce the amount of post-consumer waste. I have to admit that I am not one to crave dehydrated fruit but I now find that I am eating more and more of the ThreeWorks Apple Chips. They really are tasty. My kids like them and I shared some with our staff during treat day who gave them rave reviews. I would definitely recommend these as a healthy snack! They've even been featured recently on the Steven and Chris show and if you plan on watching Cityline today, keep your eyes 'peeled' for these delicious apple chips as they make their appearance there as well. 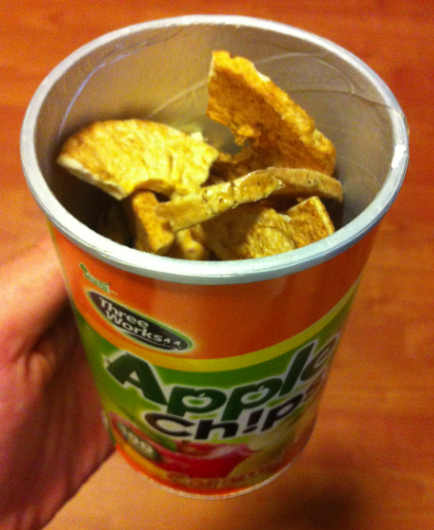 Want to give ThreeWorks Apple Chips a try? One lucky reader will win a huge basket full of Apple Chips varieties valued at $75! Enter using the Rafflecopter form below. Open to Canadian residents only, please. caramel for sure. Caramel and apples just go together. I'd love to try the caramel. I'd like to try the Cinnamon - they sound yummy. I would love to try the Cinnamon flavor. I'd love to try the Caramel:) Delish sounding! I would like to try the Original (I'm boring. haha). I would love to try the lemon flavour. I am thinking caramel!! Anything Caramel is the best ever! I'd love to try the Cinnamon flavour. Caramel or cinnamon, can't decide! Cinnamon and apple together is my favorite! I would like to try the berry mix. yumm i would like the caramel ones. I think the Original ones sound the best. I'd love to try those. They all sound good, but I think Caramel would be my first choice. I would love to try the Caramel Apple Chips. I want to try them all, but would start with caramel! Ooo.. would love to try caramel and mixed berries. I would love to try the caramel apple.